In a temple built on the sides of Mount Lugh, lived in prayer the very holy Kittah Mun-Ha, great Lama holy of holies, the one of which the God, Song Hio himself, has braided his golden beard. Not a minute, not a glance, not a thought of his life was not dedicated to the adoration, contemplation, and holy service of Tsun Kyan-Kse, the Goddess with the sapphire eyes, the one who presided over the transmigration of souls, the one who permits the Kittahs to live again in a holy animal for the duration of its animal existence, before taking again a haloed body with the full and holy perfection of the great priests. Near him was meditating Sinh, his dear oracle, an all-white cat whose eyes were yellow from the reflection of the golden whiskers of his master and from the golden body of the Goddess with the heavenly eyes; Sinh, the cat to advise, whose ears, nose, tail and extremites of his legs were dark like the color of the earth, mark of the stain and impurity of all that touches or can touch the ground. One night raiders attacked the temple and Mun-Ha was mortally wounded. 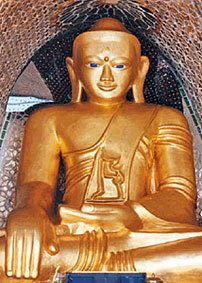 At the moment of the Mun-Ha’s ath, Sinh placed his feet on his master, and faced the Goddess. That is when the miraculous transformation took place. Sinh’s white fur took on a golden glow, reflecting the golden Goddess. His eyes became as blue as hers. His face, ears, legs and tail remained the brown of the earth, but his four paws, touching the white hair of his beloved master became pure white – as a symbol of purity. The other priests watched the transformation in awe and were inspired to fend off the attackers. Seven days later Sinh died, taking the soul of Mun-Ha to paradise. 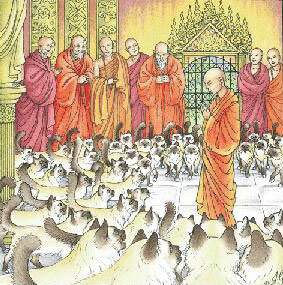 And when seven days later, the assembled priests consulted before the statue to decide on the succession of Mun-Ha, all the cats of the temple ran up. All were dressed in gold with white gloves and all had eye color changed from yellow to deep sapphire. In complete silence they surrounded the youngest of the Kittahs, thus the reincarnated ancestors were designated by the will of the Goddess. 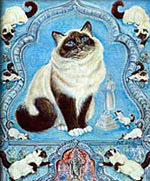 The legend states that each sacred Cat carries the soul of a priest on its final journey to paradise.